The work itself was no less complicated, for it suffered from the artist's indecisiveness - the total number of plates and the order in which they were to be issued changed repeatedly. The numerous touched proofs reveal the extent of his vacillations- in one instance as many as two hundred progress proofs were made of one plate. Nor was the collaboration between artist and printmaker straightforward- Constable's instructions to Lucas were lengthy and often disparaging. Furthermore, as work on the plates progressed, Constable's health declined. It is a wonder that these dark, brooding views of the artist's native countryside came to see the light of day. That he persisted is largely thanks to a certain spirit of competitiveness and an unshakeable belief in the purpose of his art. He undoutedly intended them to be a riposte to Turner's earlier landscape mezzotints, the Liber Studiorum, which comprised many imaginary or foreign scenes published under such generic headings as 'Epic' or 'Pastoral'. In marked contrast, Constable sought to revive an interest in the landscape of his homeland, and, more significantly, to: 'give to one brief moment caught from fleeting time, a lasting and sober existence'. It is in this aspect that he suceeds most, not least in his use of a technique so perfectly suited to his aims. The tonal process of mezzotinting, in which the plate was first darkened with a rocker before being burnished to produce the lights, was ideal for mimicking the painterly play of light and shade on the land. This was to be the last great series of mezzotints before the onset of photomechanical processes later in the 19th century. 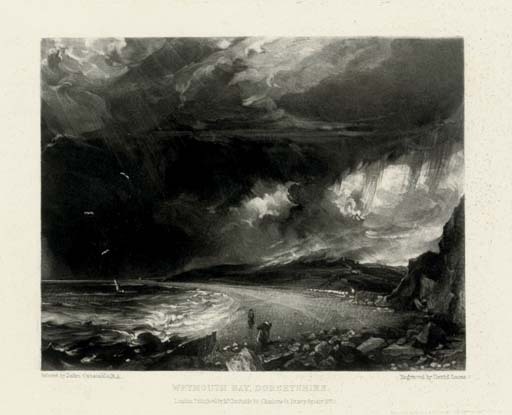 In their powerful evocation of the dramatic flux of the weather and its impact on the surrounding landscape, Constable's prints provide a timeless representation of an acutely English experience.